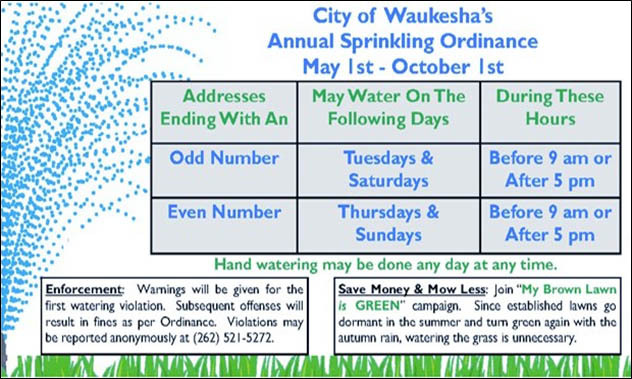 City Ordinance 13.11 applies to all customers in Waukesha and is in effect from May 1 to October 1 each year. Established lawns need only one inch of water per week. Place a tuna can or small container outside to measure this amount. Set a timer as a reminder to move sprinklers. 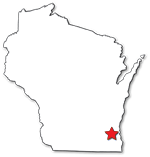 Water before 8:00 a.m. - this will limit the amount of water lost to evaporation. Avoid watering at night - this will reduce the chance of lawn diseases. Raise your lawn mower blade to at least three inches, or to its highest level - this will provide protection to the roots and allow moisture to remain in the soil. Avoid over fertilizing - fertilizers increase the need for water. Purchase a slow release, water-insoluble form of nitrogen for your fertilizing needs. Position sprinklers to avoid watering the roof, driveway, sidewalk, or street. Use sprinklers that have larger holes - water evaporates faster with sprinklers that spray a fine mist. Use drip irrigation systems for plants, trees, shrubs, and vegetable gardens. Or use soaker hoses but turn them upside down (so that holes are on the bottom). This will also help prevent evaporation.